This entry was posted on 19th October 2018 by Marci Cornett. Irish producers have certainly stepped up their game when it comes to skincare products that are just as luxurious and effective as they are ethical. We’re thrilled to introduce our newest skincare range at Organico that ticks all those boxes: say hello to Ría Organics. With Ría Organics, founder Nicola Shevlin has created a brand of beautiful, clean skincare that harnesses the transformative properties of ingredients made by nature. Before launching the Wicklow-based brand, Nicola was inspired by her work as a nurse who spealised in skin healing and renewal. She saw among the people she worked with a growing awareness about how skincare works: what goes onto the skin also goes into the body. She noticed more and more people looking for skincare that contained nothing but healthy, nourishing ingredients. 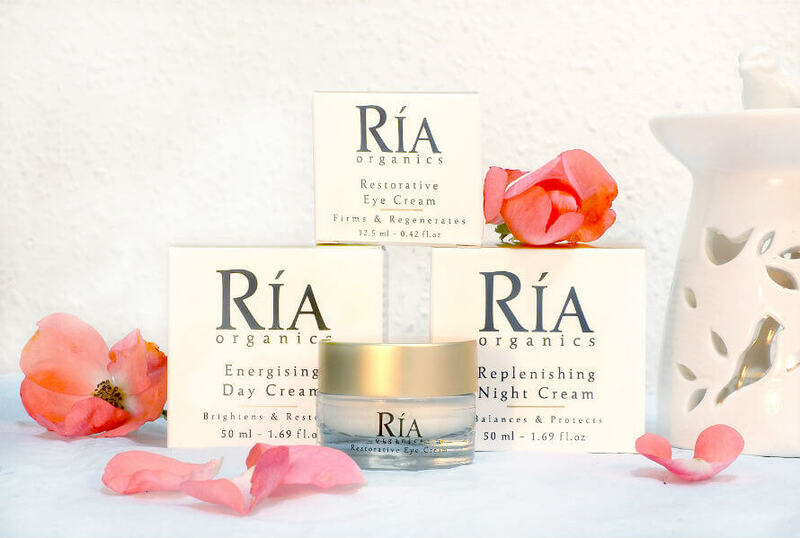 Enter Ría Organics: a boutique Irish skincare range made entirely of lovely ingredients that are clean, natural and organic. But Ría Organics doesn’t just talk the talk—they’ve got the certifications to prove their integrity. There’s their prestigious and internationally recognized Cosmos-standard from the Soil Association. Nicola acquired the certification through product testing that proved there are no harmful procedures or substances involved in her company’s growing and manufacturing processes. She even had to prove that her company doesn’t use harsh chemicals to clean its equipment. Ría Organics is also certified vegan by The Vegan Society, and it’s a cruelty-free company. An easily-absorbed face cream for the morning that promotes all-day hydration. Vitamins C and E enhance natural radiance and protect against the damage of free radicals. Hyaluronic acid retains moisture levels and encourages the plumpness of cellular walls. Rosehip and avocado oils offer smoothing effects as their fatty acids support cell and tissue regeneration. This is the cream for a balanced and beautiful complexion. A nourishing night cream that works toward a fresher, brighter complexion by morning. A rich blend of rosehip, macadamia and avocado oils deliver omega fatty acids that deeply hydrate. Antioxidants and active lupine peptides help to stimulate the production of collagen and elastin to renew the softness and smoothness of the skin. Hyaluronic acid offers anti-aging benefits that target fine lines. It’s a cream that gives ‘beauty sleep’ a whole new meaning. Help hydrate the delicate eye contour and reduce the appearance of wrinkles, puffiness and dark undereye circles. Rose flower water soothes the skin. Caffeine and cucumber extract refresh and revitalize the eye area while working to improve elasticity. Argan, avocado and apricot kernel oils moisturise and promote softness. Working together, the ingredients support brighter eyes that look and feel fresh. We're thrilled to be able to share Ría Organics with you. Look for the products on our shop’s shelves in Bantry and in our online shop. Their mission to embrace beauty and wellbeing without the use of harmful ingredients fits right in with our own.